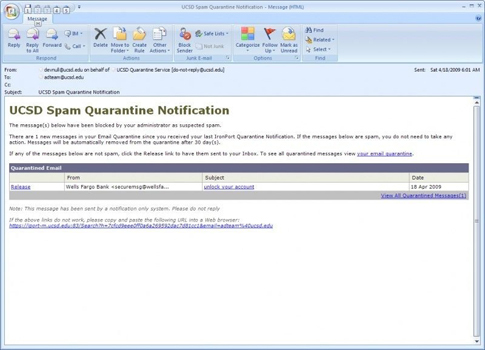 Learn how to keep your inbox safe from suspicious e-mail using the UCSD Spam Quarantine service. 1. Sign up for Spam Quarantine. 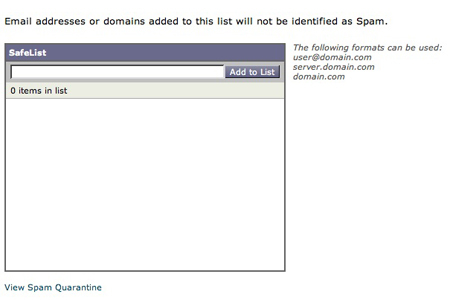 Go to the Spam Preferences tool and select Spam Quarantine. For more information about the Spam Preferences tool and your options, see Spam Overview. Go to spam.ucsd.edu and enter your Active Directory (AD) username and password. Your username is your UCSD e-mail address before the @ symbol. If you forgot your password, you can reset it at password.ucsd.edu. Click the subject link of the email you want to manage from the e-mail notice you received from Spam Quarantine and log in with your AD credentials. The email will have this subject line: UCSD Spam Quarantine Notification. This link will bring you directly to this email message in spam.ucsd.edu. Note: We recommend using Firefox for the best compatibility. If you logged in to spam.ucsd.edu, select a message to read and manage it. If you clicked the link in your UCSD Spam Quarantine Notification email, the message will already be selected. Release: Select Release and click Submit to deliver the quarantined message to your standard inbox. Release and Add to Safelist: Select Release and Add to Safelist, and then click Submit to add the sender's e-mail address to your Safelist and deliver the quarantined message to your standard inbox. Future messages from the sender will not be quarantined. Delete: Select Delete and click Submit to delete the message. Note: Messages deleted from the quarantine cannot be recovered. 4. Add senders to Safelist. Add senders to your Safelist to prevent their messages from being quarantined. 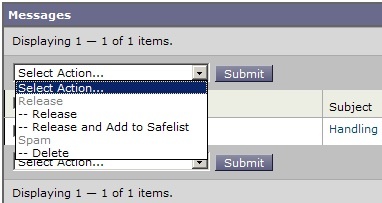 In the upper right hand corner of the page, click Options and select Safelist. Enter the e-mail address, and click Add to List. Note: If a message contains a virus, it will not be delivered to your mailbox, even if the sender is on your Safelist. Use this function to block known spammers from your inbox. 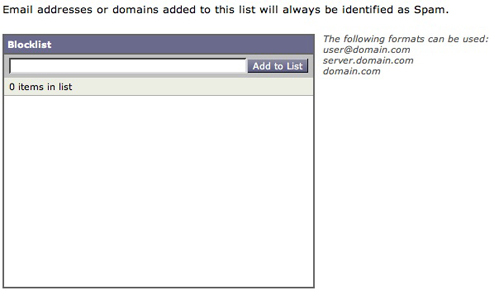 In the upper right hand corner of the page, click Options and select Blocklist. Enter the address and click Add to List. Note: Mail from senders added to the Blocklist are deleted automatically and will not appear in your quarantine.